Hanover County Economic Development (HCED), in partnership with Hanover County Public Schools (HCPS) and the Capital Region Workforce Partnership (CRWP), hosted the county’s inaugural InspireYouth@Work Summer Opportunities Fair on Saturday, March 30, 2019. This event, which was free to employers and attendees, provided an opportunity for local government, businesses, and not-for-profit organizations to publicize summer opportunities, including job, volunteer, internship, and leadership development openings for youth ages 14-24. After heavy promotion by the schools, partner organizations, social and news media, the fair attracted 22 employers and 347 attendees. 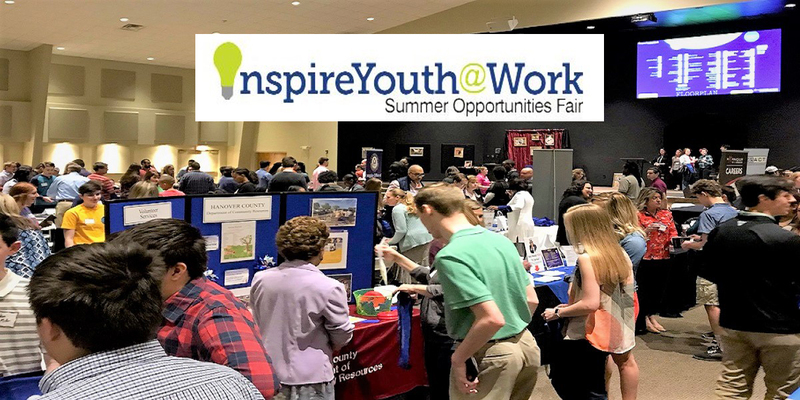 The InspireYouth@Work Summer Opportunities Fair, administered through the CRWP, has been held annually in neighboring localities over the past six years. To facilitate the fair being expanded to include Hanover County in 2019, HCED provided the needed connections to assist HCPS with coordinating the event. With the support of HCPS, the Hanover Education Foundation, HCED and Hanover government leadership, the event was held at Life Church, which is centrally located in the Atlee area of Mechanicsville. Giovanni’s Pizza, Pasta & Subs, located in the Hanover Commons Shopping Center, donated lunch for the event’s volunteers and exhibitors. The Capital Region Workforce Partnership is an eight-jurisdiction consortium with elected representation from Henrico, Hanover, Charles City, Chesterfield, Goochland, New Kent and Powhatan counties and the City of Richmond. The Partnership, in cooperation with the Capital Region Workforce Development Board it appoints, has responsibility for oversight and disbursing federal funds allocated to the region from the Workforce Innovation and Opportunity Act of 2014, and other federal, state, and local grants and resources that become available. Provide regional leadership to develop innovative strategies and deliver services that advance and sustain workforce solutions. Align workforce development efforts to business and economic development needs to ensure a demand driven system. Develop and advance partnerships with other service delivery organizations to minimize duplication and deploy resources in a more efficient and effective manner. Raise awareness of the public workforce development system as the “go-to place” for workforce solutions for both business sector and job seekers. For more information about resources available to job seekers and businesses, visit Virginia Career Works – Capital Region. To learn about more opportunities to connect your business with Hanover County Public Schools, please contact us at econdev@hanovervirginia.com or call (804) 365-6464.